On June 2, His Honor Lieutenant Governor Steven L. Point of British Columbia and Bob Blacker, Rotary International and former Lieutenant Governor (2008-2009), along with Rotary Club members of Quesnel, Liz Neave, Steven Rollins, Keith Corbett, Rebecca Beuschel of Quesnel Literacy and Jadyn Koldeweihe Miss Tré Spa a candidate for Miss Quesnel, travelled to Lhoosk’uz Dené Nation (Kluskus) to have dinner with the elders and band members. During the visit, the Lieutenant Governor and Rotary Club members met with the school children and presented them with books from the Quesnel Literacy Program. The visiting dignitaries commented they had never seen such an organized and structured class room. The Lieutenant Governor drummed and sang while the school children sang O Canada in Carrier. The whole community and visitors also sang happy birthday to the community’s oldest elder Matilda Chantyman who turned 95, June 3. Organizers of the visit thanked everyone for travelling to Lhoosk’uz Dené Nation (Kluskus). 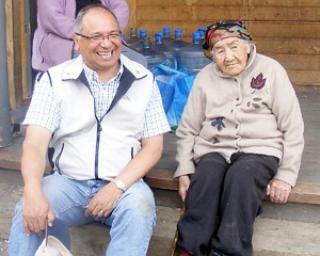 Here is His Honour Lieutenant Governor Steven Point of British Columbia posing with our oldest Elder Matilda Chantyman. Posted in News | Comments Off on His Honour visits Kluskus!